Source: From the Publisher via NetGalley for an honest review. The majority of you who voted in my TBR List poll chose Delia's Shadow by Jaime Lee Moyer as my February read, and I cannot thank you enough. Delia Martin left her comfortable life in San Francisco behind in an effort to avoid the dead who haunt her, taking a job as a teacher on the East Coast. She is drawn back, however, by a ghost who has traveled a long way to ask for her help. Only Delia isn't sure what help she is being asked to provide exactly. Things begin fall into place when she arrives back in San Francisco. Her best friend's fiancé and his partner are in the middle of a serial murder investigation that has them stumped and frightened. The murders are growing more grisly and personal. And they are eerily similar serial murders that took place thirty years before. Could they be connected? Is it the same killer? The ghost haunting Delia is becoming more powerful, and Delia is intent on finding out what she can about the woman's death and in stopping a killer from claiming anymore victims. The police are desperate for answers and Lieutenant Gabe Ryan is willing to do anything, including using unusual methods to catch the killer--like using a psychic. Delia's Shadow has a strong sense of place. I have long been enamored with the city of San Francisco and its history. The novel is set nine years after the Great San Francisco Earthquake and Fire of 1906, just in time for the Panama–Pacific International Exposition. The author paints a realistic portrait of the city during that time period. It was hard not to feel a part of it. Delia and Gabe are no strangers to loss, both having lost loved ones in the earthquake and fires that followed. While Delia has come to terms with the past, Gabe is still struggling to do so, unable and unwilling to completely move on. There is something about Delia, however, that awakens something inside him, and those strings to the past begin to loosen. I quite liked Delia and her friends (although I wasn't too fond of Isadora, who I just didn't connect with at all). She has been able to see ghosts since childhood, and it became unbearable right after the terrible earthquake and fire that took her parents. She could not go anywhere without seeing ghost upon ghost. Returning home brings much of that back for Delia, but she uses it to her advantage, trying to learn to control her gift, and find justice for the victims of a serial killer. The mystery is quite dark. The killer has the upper hand for much of the novel and even I was beginning to wonder if the good guys would ever find the murderer. The ghosts added to the atmosphere of the novel, making it all the more creepy and raising the stakes higher. I enjoyed every minute of it! Even so, I would not have minded more insight into the murderer, even beyond what was offered. While the romance plays a part in the novel, it isn't its strongest asset, I didn't think. I really liked both characters involved and hoped they would come together, but it took me awhile to buy into the romantic thread of the story. 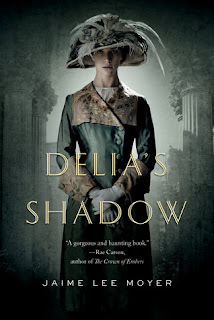 Overall, I enjoyed Delia's Shadow quite a bit. I was happy to discover there are two more books to look forward to, featuring the same characters. To learn more about Jaime Lee Moyer and her work, please visit the author's website. She can also be found on Goodreads and Twitter. Oh, I do like the sound of this one and I've long been interested in the San Francisco Earthquake and Fire of that long ago time period. Thanks for reviewing it. Definitely sounds like a book I'd enjoy a lot. And 2 more afterwards. Good! Kay - I do recommend it! I hope you get a chance to read it. I am looking forward to the other books. Ghosts and mystery sounds like a great combination to me! This one sounds good to me so I might want to check it out. Thanks for sharing your thoughts with us, Wendy! Melody - I agree! This book brought together quite a few things I enjoy in a book, and so I am glad it didn't disappoint. My expectations were kind of high, admittedly. This looks absolutely amazing! I loved the blurb so I was relieved to see you enjoyed the book. It would have been a shame to waste the concept on a not so good book. Plus I love the dress on the cover. I read this last year or so and was one who voted for you to read it. It just seemed to be something you'd be comfortable with. Not everyone can enjoy a story with PN elements to it. Rita - I am glad you voted for it. It was a good choice! :-) You are right about me--I don't mind the paranormal elements at all. It makes things a bit more intriguing in some ways, I think. This sounds like a very interesting read. And that cover also really works I think. Maureen - Yes, the cover is very fitting for the time period. I hope you do give this one a try! I love this book. It's the best of the three that Moyer has written about Delia; the other two are good reads, just not as good as this one. Don't you love a great ghost story? Lark - Ghost stories are great! I look forward to reading the other books in the series. It wasn't until recently I found out it even was a series. I'm so glad you liked this book. My favorite characters are definitely Delia and Gabe. You are right, Isadora is a bit harder to connect with but I think she's easier to take in the following books. Hope you'll continue with the series! I'm generally not much of a fan of books with paranormal themes. But then, a good book is a good book and sometimes I just have to get over that and read the thing, right?! Lisa - Sometimes you have to give a book a chance anyway. :-) I've had good luck with that and bad. Haha! Delia's Shadow sounds good and the setting too. I like that there's ghosts in the storyline. Great post! Naida - I really enjoy ghost stories. I should try to read more of them. This was a good one, darker than I expected, but I still really enjoyed it.